One of the biggest obstacle many parents face is having enough money to support their child's higher education. Parents of the "Baby Boomers generation" whom have already experienced this stage of life would agree that the largest chunk of their savings are spent on ensuring the best possible higher education for their child. However among newly weds or parents with young toddlers, it is easy to brush aside this matter especially since the issue would only surface 20 years down the road. Rising household debts due to uncontrolled spending have largely contributed to the procrastination of many parents when it comes to starting of a child education fund. "Aiyah...why worry so much...20 years long way to go..plenty of time to save money for my kid's education"
"If not enough money, PTPTN can provide loan cover for me"
This goes to show that many young parents only see the immediate picture based on the responses above. Have they thought about the following possibilities? The future is full of uncertainties, what if 20 years down the road you are retrenched and unable to pay for your child education? The cost of an engineering degree from a local private university cost about RM70,000 at present, with raging inflation what do you think the cost would be 20 years later? RM120,000? RM200,000? PTPTN can be a savior for your procrastination. Despite that, you've knowingly placed your child in debt even before he or she starts working. What would your child think of you? You can take a portion of your EPF to pay for your child education in the future but wouldn't that leave you with lesser to retire upon? Child education worries is akin to a buzzing mosquito hovering consistently at our ears all the time. We can choose to ignore the buzzing and live with it only to suffer the consequences of getting bitten 20 years down the road. Or perhaps we could do something about it now and swat the irritating mozzie away once and for all. 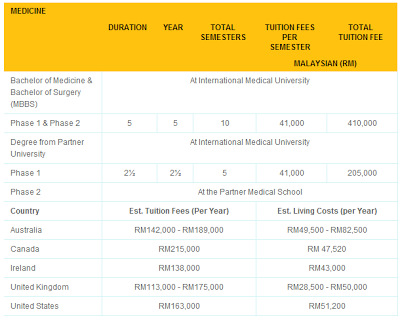 Let's take a look at the present cost of education by sampling the Fee Structure from International Medical University (IMU) Malaysia. Inflation..inflation...inflation...we are all enslaved by it. Inflation is the reason why prices of goods and services are increasing yearly. Hence, to protect the value of your savings from being depreciated by inflation, you have to ensure that your money/savings is growing faster or at least equivalent to the inflation rate. The obvious answer to fighting inflation is via investing. Never the less I should forewarn that there will be risk involved in any form of investing. Even if you're stashing your money in a Fixed Deposit account, there will be risk. Are you able to guarantee that the bank holding your fixed deposit account would not default? Remember Lehman Brothers? *Noticed I used the word "passive" investing? I have to be clear on this since stocks and properties are also investment options available for everyone. Yet both the options were omitted from the table because I consider them as "active" investing. Active investing requires the investor to spend time and effort into researching and making the right selections. Not everyone, especially parents with kids could afford to do active investing, juggle their careers and manage their family all at the same time. One of it would give way eventually. The subject of investing to build a Child Education Fund is a touchy topic to blog about. Firstly, investing itself is perceived as a negative sure lose option. Secondly the goal of the education fund is so far ahead in the future that many parents fail to visualize it. My self realization begin when I begin to take financial planning and investing seriously. Despite not being married...yet..., I've already started out investing into a balanced unit trust fund for my future (hopefully) son or daughter. If by faith I am not blessed with a child, then the invested amount would then be converted into my own retirement fund. Investing in unit trust is a step I am willing to take after understanding how it works as well as how to reduce the risk involved. I've made my choice, I hope that you will too! 1. Sharing this post on your Facebook!